A book can endear itself to me by making me feel for the main character. If I can connect with that one person, odds are good that I will love the book. Cather, Cath for short, was one of those characters. She felt so much like me that it was almost like reading a story version of my own life, even though nothing like this has happened to me. Fangirl was one of those books like I couldn’t put down until I was finished. I just had to keep reading. Cath and Wren are twins, but in looks only. Where Wren is outgoing and ready to take on the world, Cath finds comfort in the same things and doesn’t see why she should change that. She’s happiest among fictional characters and people she doesn’t see. She’s a writer and uses her words to explore the world, instead of getting out there herself. After Wren decides she doesn’t want to room with Cath their freshmen year of college, Cath is forced to meet a few new people who eventually change her life for the better. I am constantly amazed when an author just gets it. Cath is introverted and nothing is wrong with that. I’m an introvert and the feelings Cath has about going out and being around other people are my feelings. It’s not that she doesn’t like other people, it’s that being around them is draining. Having to act as though your skin isn’t crawling with the need to be alone can be a lot. On top of that, Cath has the insecurities that any 18 year old would have. My heart ached for Cath, but I also saw myself in her. It made for an interesting feeling while reading. The relationship between Cath and Levi was sweet and grew slowly. It never felt forced and it always made me smile. Levi didn’t see Cath’s habits as a bad strange, but instead saw them as what made her unique and worth knowing. To have a character not only acknowledge that but make it important only made me fall for him more. Rowell has a way of writing that draws me in completely. She writes drama without it being dramatic and love without being cheesy. It doesn’t hurt that she writes about Nebraska (the Valentino’s reference in the first chapter made my mouth water). She just gets it. I can safely say that I am now a complete Rowell fan and will read anything she writes. 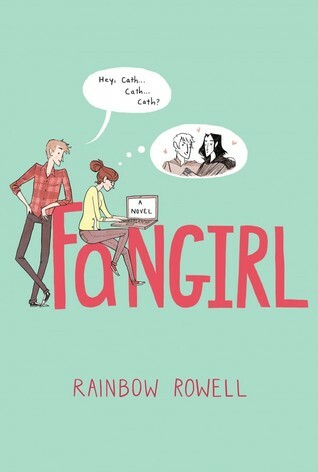 Fangirl is the perfect story about a girl coming into her own and finding out that sometimes the real world can be just as wonderful as the fiction world. This is a definite must read. This entry was posted in Contemporary, The Must Reads, Young (and New) Adult and tagged Contemporary, Must-Reads, Rainbow Rowell, Young Adult.